For at least 50 years the Venetian merchants had accepted the depredations of the Slav pirates centered around the Narenta [Neretva] River on the Dalmatia coast, sometimes assisted by other Dalmatia neighbors, as an unavoidable fact of life. Finally, the merchants settled into a custom of simply paying annually for safe passage through the mid Adriatic. Pietro II Orseolo was of a different mind. From the time of his election as the 24th Doge of Venice, 991, at the age of 30, he wove a net of diplomacy through the Northern Adriatic and upper coast of Dalmatia as a foundation for the total extinction of the Dalmatian pirates and Venice's first major territorial expansion. After using diplomacy to isolate the Narentan Slavs from their neighbors in the former Roman cities of Dalmatia, Orseolo personally put to sea on Ascension Day 1000 at the head of one of the mightiest fleets ever seen in the Adriatic. As the fleet drew near, many of the Narentan leaders surrendered immediately, without a battle. The islands of the Narenta delta that remained recalcitrant quickly found their cities efficiently and methodically assaulted and captured. Returning to Venice in complete triumph, the strength of the pirate lairs broken forever, the Doge assumed a further title: Duke of Dalmatia. 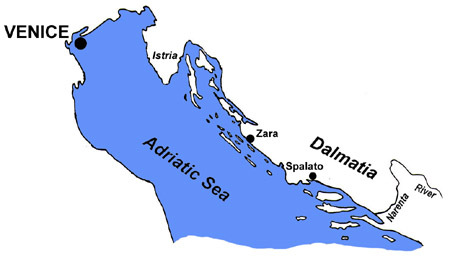 The Dalmatian cities acknowledged the rule of Venice by agreeing to pay annual tributes. The 500-year territorial expansion of Venice had begun.